From Bebe Rexha to Lady Gaga, here are all the looks from the 2019 Grammy Awards. 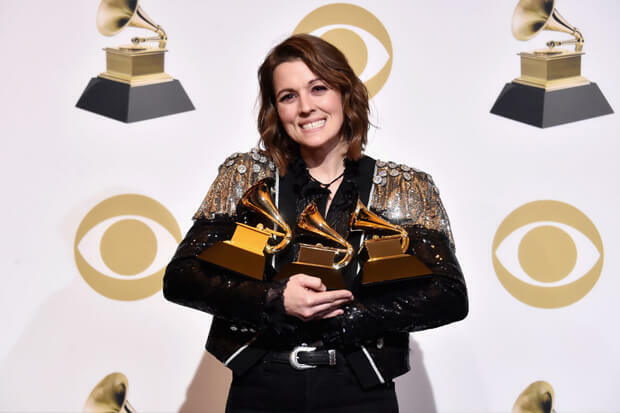 In addition to prestige and recognition, a Grammy award (or even a Grammy performance) also gives an artist a welcome sales boost. That is becoming harder gauge in the streaming age, but iTunes still offers some insight. As expected, last night’s big winner is reaping the most reward. Kacey Musgraves’ Album Of The Year-winning Golden Hour, shot straight to number one on iTunes. Not only that, but her entire discography enjoyed gains with Same Trailer Different Park and Pageant Material returning to the top 100.
Who else got a nice boost? Well, Dolly Parton has multiple greatest hits compilations (and the Dumplin’ soundtrack) soaring up iTunes. H.E.R.’s Grammy-winning debut album is top 5, while Cardi B’s Invasion Of Privacy and Janelle Monae’s Dirty Computer are just outside the top 10. On the singles side, Dan + Shay’s “Tequila” has returned to the top 10, while Shawn Mendes’ “In My Blood” is hovering just outside it. It will be interesting to see how these gains impact next week’s respective Billboard charts.